The Oreninc Index fell in the week ending May 11th, 2017 to 36.89 from 46.28 as gold and other commodities had a more stable week. Total raises announced decreased to C$68.4 million, an 18-week low, which included five brokered financings for a total of C$24.0 million, a two-week low within which there were three bought-deal financing for C$22.0 million, a three-week high. 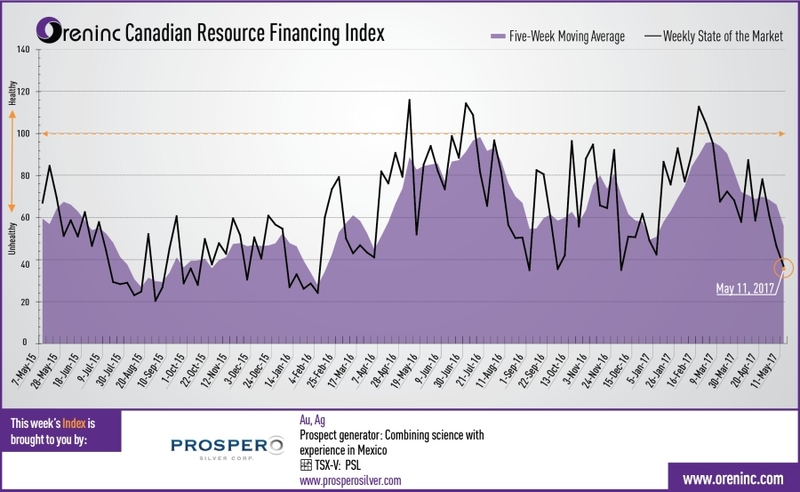 The average offer size increased to C$4.0 million, a seven-week high, whilst the total number of financings announced fell to 17, a 67-week low. This was the second week in a row where more deals closed versus opened. The gold price experienced a slight rebound to seemingly bring an end to its recent pummelling, ending the week up at US$1,228 per ounce from $1,226 the week before. The van Eck managed GDXJ returned to growth this week and is again in positive territory for the year, up 3.14% so far in 2017. Following the plummet in the gold prices the previous week, the inventory of the SPDR GLD ETF saw a slight fall to close the week at 851.89 tonnes from 853.08 tonnes the previous week. Silver followed gold and fell considerably to close at US$16.27. Copper was down slightly on the week at US$2.52. Oil fell about 10% on the week with WTI crude closing at $46 per barrel due to concerns about the continuing glut of worldwide supply. OPEC is due to meet on May 25th and is expected to discuss cutting production quotas to boost prices. The Dow Jones Industrial Average pulled back to close at 20,896 and Canada’s S&P/TSX Composite Index followed suit and closed at 15,537 but the S&P/TSX Venture Composite Index saw growth return and closed up on the week at 793.64. Number of financings decreased to 17, a 67-week low. Five brokered financings were announced for $24.0m, a two-week low. Three bought-deal financings were announced for $22.0m, a three-week high. Total dollars dropped to $68.4m, an 18-week low. Average offer size increased to $4.0m, a seven-week high. Continental Gold (TSX:CNL) announced a US$134 million financing to complete the capex fund raise to build a 250,000 oz/y underground gold mine at Buritica in Colombia. Almaden Minerals (TSX: AMM) entered into an agreement with Sprott Capital Partners and Cormark Securities for a bought deal private placement to raise C$15 million to advance the Tuligtic gold-silver project in Mexico project through continued engineering, permitting activities and exploration drilling. Continental Gold (TSX:CNL) opened a C$36 million offering on a strategic deal basis. The deal is expected to close on or about May 18, 2017. Almaden Minerals (TSX:AMM) opened a C$15 million offering underwritten by a syndicate led by Sprott Capital Partners on a bought deal Each unit includes half a warrant that expires in 36 months. Cartier Resources (TSX-V:ECR) opened a C$01 million offering underwritten by a syndicate led by Canaccord Genuity on a bought deal basis. The deal is expected to close on or about May 30, 2017. EnerGulf Resources (TSX-V:ENG) opened a C$5 million offering on a best efforts Each unit includes a warrant that expires in 24 months. Bullman Minerals (TSX-V:BUL) closed a C$03 million offering on a best efforts basis. East Asia Minerals (TSX-V:EAS) closed a C$3 million offering on a best efforts basis. Each unit included half a warrant that expires in 60 months. Fura Emeralds (TSX-V:FUR) closed a C$05 million offering on a best efforts basis. Each unit included half a warrant that expires in 24 months. Rise Gold (CSE:RISE) closed a C$07 million offering on a best efforts basis. The Fortuna strategic investment provides Prospero with the funds for proof of concept drilling on its three main properties, which if successful, could lead to Fortuna entering into one or more joint ventures with the company to fund ongoing exploration.